As parents strongly opposed to abortion my husband and I were very concerned to learn that many childhood vaccines are manufactured from the cell lines of aborted babies. We succeeded in obtaining alternative polio, measles and mumps vaccines for our children, but were told that no alternative rubella vaccine existed. During the mass measles vaccination campaign in 1994 we did not allow our children to have the Measles, Mumps and Rubella (MMR) vaccine provided by the government. Our children received instead a measles-only vaccine derived from animal cells. I have continued to try to find alternative vaccines both from the UK and elsewhere. I have recently obtained a rubella vaccine from Japan. Our own children and eight others have recently received this vaccination. This vaccine is derived from rabbit cells. Though widely used in Japan for fifteen years, it is not licensed for use in the UK. However it can be obtained and administered by GPs. I am writing this article to provide the information I have obtained to other concerned parents. With this information, you will be able to determine whether the vaccines administered to your children are derived from aborted babies, and to decide whether to seek out the alternatives. Some common vaccines, including the rubella component of all MMR vaccines worldwide except Japan, are produced from cell lines produced from the tissue of aborted babies. Two cell lines commonly used are MRC5 (Medical Research Council 5) and WI-38 (Wistar Institute 38). MRC5 originates from the lung tissue taken from a 14 week male foetus aborted for "psychiatric reasons" from a 27 year old woman in the UK in the 1970s. WI -38 originates from a female foetus aborted for "psychiatric reasons" in the 1960s. These abortions were not done for the purpose of producing vaccines. In general, those with objections to abortion will consider any use of material from aborted fetuses to be ethically dubious. This is not always taken as a conclusive argument against the use of these vaccines (especially when no alternatives are available), but it is a serious consideration for many Roman Catholics, Muslims, and members of other religions, and of none, who are opposed to abortion. If abortion is immoral then profiting from it must also be immoral. The unborn child was unable to give consent for its body parts to be used, so it is therefore disrespectful to the dead. This is different from an adult donating a body part such as a kidney (as one vaccine manufacturer claimed) because the adult must always have given consent. Some would argue that the fetal tissues would just go to waste if they were not used but this excuse was not accepted at the Nuremberg trials of scientists who used body parts from concentration camp victims. This abuse of the child's body only compounds the injustice of the original abortion, even if the vaccine producers were in no way connected to the abortion. Use of this vaccine implies acceptance of the legality of abortion, and does nothing to discourage the use of foetal parts or cell lines in vaccine manufacture or other branches of medicine, or to encourage research into other materials. We believe it would be wrong to give our children a vaccine which we would not use on ourselves when they are too young to decide for themselves. We have taught them that abortion is wrong it would therefore be inconsistent to give them the vaccine. Some people do not consider the manufacture of vaccines from animals to be ethical. Such people will not be able to accept any viral vaccine, since a virus has to be grown on living cells. However we do not take this view. Vaccines for viral diseases need to be grown on living cells. Cell lines are often used. This involves taking cells from an animal or aborted baby and growing them for many generations in a laboratory. Viral infections for which vaccines are available include Measles, Mumps, Rubella (German measles) Rabies, Hepatitis A, Yellow fever, Japanese encephalitis and influenza. Vaccine production for bacterial infections does not involve cell lines, human or animal. Bacterial infections for which vaccines are given include Whooping Cough, Tetanus, Diphtheria,Typhoid, Tuberculosis and HIB. The meningitis vaccine being given to students is against meningoccocal strain C. This is a bacterial infection and therefore is not grown on human or animal cell lines. The following list of vaccines licensed and commonly used in the UK are derived from foetal cell lines. See also US vaccine information. 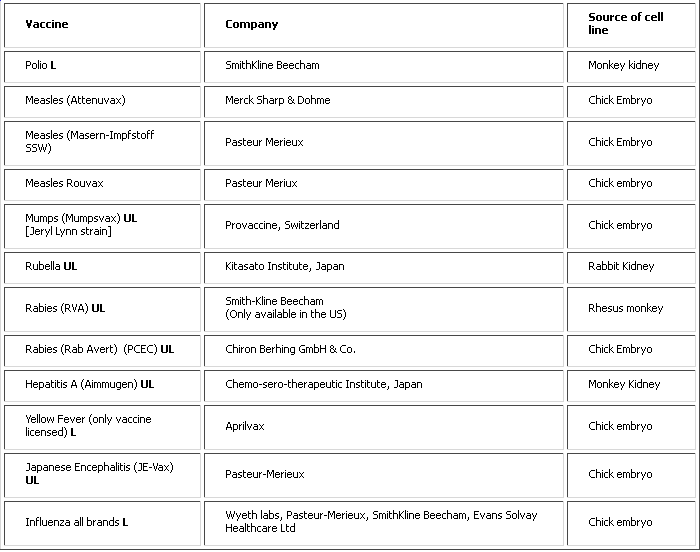 Note that the Kitasato Institute rubella vaccine is not licensed for use in the UK at present. It is only Japan which uses animal cell lines for rubella vaccine. All other vaccines in the world use foetal cell lines. The Kitasato Institute has kindly agreed to supply their vaccine. They have made it clear that no compensation is available outside Japan for any side effects as a result of the vaccine in line with Japanese law. Your doctor can obtain this vaccine by contacting IDIS World medicines in London. IDIS have received permission to import this vaccine by the medical control agency after a doctor from our campaign persuaded them of the safety and effectiveness of this vaccine. Your doctor must agree to take responsibility for injecting the vaccine and must sign that he will make no claim against the Kitasato Institute. The vaccine must not be passed on to a third party. As an unlicensed vaccine it is only available on a named patient basis. This vaccine gives 98.9% immunity. Side effects are rare and usually mild. They include joint pain, swelling of the lymph glands or a rash. These disappear in a few days. There have been reports of serious allergic reactions at around 1 in 100,000 cases. This is probably due to gelatin allergy. In the fifteen years up to 1996 (the latest time from which evidence is available) no serious complications were reported. Full details of the vaccine are available from IDIS or from us. We can also supply sample patient consent forms for doctors. We have become aware that there is a treatment available to non-immune women unfortunate enough to come in contact with rubella during pregnancy. A handicapped baby or abortion are not the only options. This is called Rubegam IM and is available from Natal Bioproducts Institute. The manufacturers state "rubella immunoglobulin may afford some protection against congenital rubella when used in pregnant patients who in the first few in the first few months of pregnancy will not consider termination of pregnancy." It is appalling that this seems to be offered as a last line of defense only after a woman has considered abortion and is not initially offered to all women at risk. Obviously the possibility that handicap could be avoided would effect the mothers decision on whether to have an abortion. On the dozens of internet pages devoted to rubella this treatment seems to be either unheard of or ignored. Only two sites apart from the SAEPI site mention it. The Merck manual states " Women exposed to rubella early in pregnancy should be informed about the potential risks to the foetus, and termination of pregnancy should be considered. Some authorities recommend administration of immune globulin (0.55ml/Kg) for exposure early in pregnancy.? Another site Anti viral therapy states ?Passive immunisation with anti-rubella immunoglobulin is used in rare instances when therapeutic abortion is unacceptable and foetal monitoring is possible." Many sites consider congenital rubella syndrome to be the inevitable consequence of not receiving a vaccine. Although the effectiveness of rubella immunoglobulin is doubted by some authorities it must be worth trying. Also only 20-25 % of babies whose mothers contract rubella are affected in any way and some cases are very mild and treatable. It seems that abortion is recommended when mothers contract rubella even if four out of five babies are totally healthy. Rubella immunoglobulin does not appear to be available in the UK. It is vital that women keep their immunity up to date with vaccination to avoid the risks. We would hope considering the importance of the vaccine that GPs and medical authorities would co-operate fully with requests for the alternative animal cell line rubella vaccine from Japan. The rabies vaccine used in the UK is immovax (HDCV human diploid cell vaccine) produced by Pasteur Merieux from MRC5. This is also the most widely used rabies vaccine in the USA. However also licensed by the FDA (Federal Drugs Administration) are another human diploid vaccine DCO, a vaccine from a cell line of foetal rhesus monkeys (above) and a vaccine grown on chick embryo cells (PCEC). It should be noted that the human protein remaining in the HDCV even after purification has been shown to produce an allergic reaction due to an interaction with one of the other components in 6% of patients (reference Michigan department of health). Therefore pre-exposure doses of this vaccine are limited despite the necessity of keeping immunity up in those at risk. PCEC also contains trace elements of human protein which have been reported to have produced allergic reactions. PCEC is also cheaper and easier to produce than HDCV according to the FDA. It is possible to use unlicensed vaccines in the UK with the agreement of your doctor (and probably his/her insurers). It is up to you and your doctor to access any risk and take responsibility for using them. However in 1999 the government wrote to chemists and drug importers forbidding them from importing any alternatives to MMR except in special circumstances. They did allow children who had started to finish the course. Many parents have gone to France in order to start the course. It is now difficult to find a GP who will administer the single doses of measles, mumps and rubella. There are a few doctors throughout the UK who have managed to get supplies and are willing to administer them. These are mainly private clinics. The vaccines that these clinics supply may not be the ethical ones . I am currently trying to come to an agreement arrange for a London based clinic to agree to import Rouvax, mumpsvax and Rubella Takahasi strain on request. The vaccines we have listed, apart from the Japanese rubella vaccine, are from countries and companies frequently used and trusted in the UK. We have suggested licensed products where possible unfortunately there are no licensed alternatives for rubella, Hepatitis A and rabies. The Government had been aware that many people are opposed to vaccines from foetal cell lines since 1993 when MP Ann Winterton MP put down a Parliamentary Question on the subject. This was answered by Tom Sackville. He gave no new information, ruled out the labelling of vaccines produced from foetal cell lines and stated "that a switch to the use of other materials would cause major supply problems, probably for many years and the production of rubella and hepatitis A vaccines would cease". He made no commitment to encourage research into other materials or consider whether an ethical vaccine could be obtained abroad. Although this information was not publicised widely until it became of general interest due to the Government's mass MMR immunisation campaign in 1994, the Government had been made aware of the problem over a year earlier and should have anticipated pro-life objections and investigated other vaccines, especially since there is no ethical objection to the measles component of the vaccine. Our child received the measles only injection and some Catholic schools provided only the measles inoculation rather than the MMR. We understand that due to the concern expressed at the time of the measles campaign Sir Kenneth Calman the Chief medical officer agreed to ask the pharmaceutical companies to investigate alternative cell lines for Rubella vaccine production but received no interest from the companies who consider the current vaccine to be effective and relatively free from side effects. They are presently under little financial pressure to change from using foetal cell lines. I hope by publishing which vaccines are made from foetal lines and making people aware that there are alternatives the companies can be encouraged to use animal cell lines in future vaccine development and even change present vaccine production to animal cell lines if there is enough consumer pressure. As can be seen from the above list the drug manufacturers who make vaccines from animal cells lines also make other vaccines from human foetal cell lines. There are no all good and all bad companies. If people request the animal cell lines and tell the companies why they do not wish to use the human foetal cell lines it is possible that one company could be persuaded that there was mileage to be made out of switching to all animal cell lines. We would be delighted to publicise any company that chose to take a moral line on this. I would also like to add that spokesmen for the Roman Catholic church only said that use of the vaccine could be considered the lesser evil on the basis that there were no alternatives available, and in the light of exaggerated government predictions of a huge measles epidemic. I am sure that now a suitable alternative has become available they will reconsider their statements on the MMR vaccine. The informaton in this article is now as up to date as I can make it, but I will try to update it as necessary. The information comes from a variety of sources and I can not guarantee that it is correct, or has not changed. You should check the suitability of vaccines with your own doctor and supplier. I would welcome any assistance in keeping this list up to date. Please E-mail me if you have trouble obtaining any of the vaccines. I would be pleased to include any comments or corrections from drug companies. * New links providing evidence of the use of aborted babies in vaccine manufacture. Letter from C .Bolwell Product information Associate, International Medical Affairs. ABPI data sheet compendium published by Datapharm publications 12 Whitehall place London. For information on the cell lines used in their vaccines. Smithkline Beecham Mundells, Welwyn Garden City, Hertfordshire, England. Pasteur Merieux MSD Clivemont House, Clivemont Rd , Maidenhead, England. The Kitasato Institute Research Center for Biologicals, 6-111 Arai, Kitamoto-city, Saitama 364 Japan. South African electronic products inserts.